Your site could not be unique without the ability to control and create custom fields for your users. At phpFox, we allow you to manage this kind of information in the Admin Control Panel via the Custom Field system. With this flexible and elegant tool, you can enrich your users' information according to your need. You can also control what custom fields will be added for each user type in the registration form as well as in their profile. 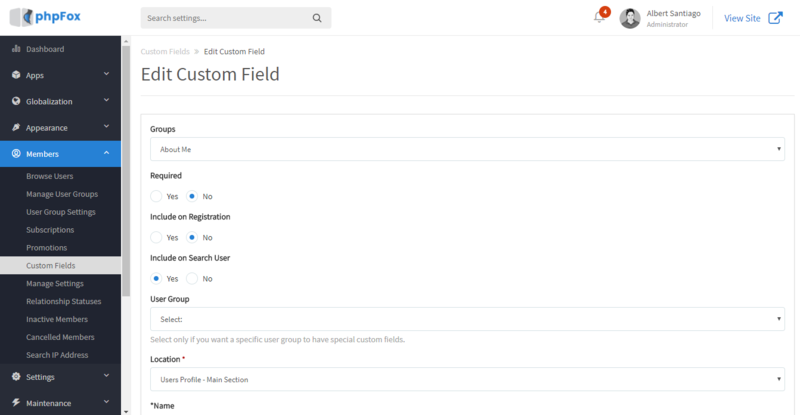 For each custom field you create, it can belong to a custom group. By splitting up your fields into groups it will make it a lot easier for your users to edit these fields. You can define where a custom field should be located when it's being displayed on a user's profile. It can be either within the "Basic Information" or "Main Section" block. You may want certain fields to require a value when a user registers or edits their profile. This option allows you to add each custom field to the registration form or not. We support the following custom fields: Large Text Area, Small Text Area (255 Characters Max), Selection, Multiple Selection, Radio, Checkbox. To re-order custom fields shown on user profiles, you may use drag and drop feature. Your users can edit the values for your custom fields from their "Edit Profile" section. All the custom fields are placed there and neatly grouped for easy and quick access. Custom fields values could be seen on user profiles.